The first registration. | Scuffalong: Genealogy. The first registration. – Scuffalong: Genealogy. Rowan County, North Carolina, 1866. The war is over. The 14th and 15th Amendments have not yet passed, but the county’s hopeful freedmen have come out en masse to register to vote, perhaps under the auspices of the Freedmen’s Bureau. 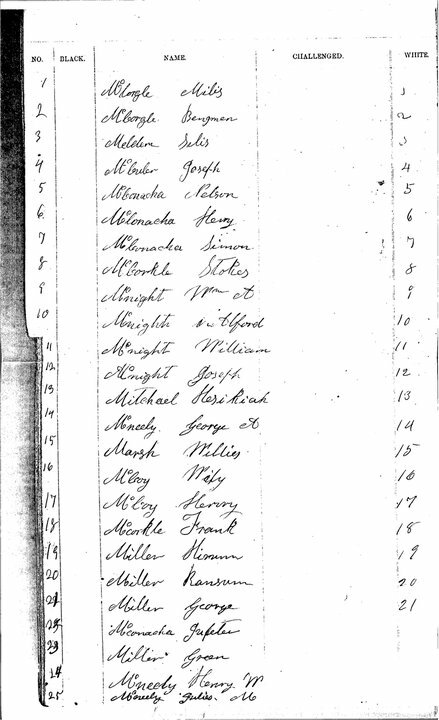 Among them, my great-great-grandfather Henry W. McNeely, his half-brother Julius McNeely, and his future in-laws Ransom, George and Green Miller. Henry’s father John W. McNeely, Confederate allegiance renounced and U.S. citizenship restored, was also there — his world upside down. ← The case for the Skipps as James Henderson’s children. The year given is 1866 & the 15th amemdent is said to ‘have been passed.’ But the 15th Amendment was not proposed until Feb. 1869. It was not proclaimed as being adopted by the U.S. Sec. of State until March 30, 1870. Voting was probalby controlled by one of the reconstruciton acts passed by Congress. You’re absolutely right, Richard. Thanks for pointing out that incongruity. A little further reading informs me that there was limited voting in southern states in areas controlled by the Union army. I’ll have to dig into Freedmen’s Bureau records to try to find more about what was happening in Rowan County. Pingback: Could I do any less … | Scuffalong: Genealogy.